We had a great response to the oilskin competition, there were so many lovely and interesting designs. We made a judgement on how suitable each design was for oilskin and some we felt, although beautiful, would work better in other fabrics. We also looked at what we already had in development and whether there was any overlap. The reason we choose Lucy’s was because it was something we felt we would all wear and we didn’t have in our collection. It would work in both traditional and dry oilskin. The addition of a scissor pocket adds to the practicality for any maker. So well done Lucy a simple but winning design! 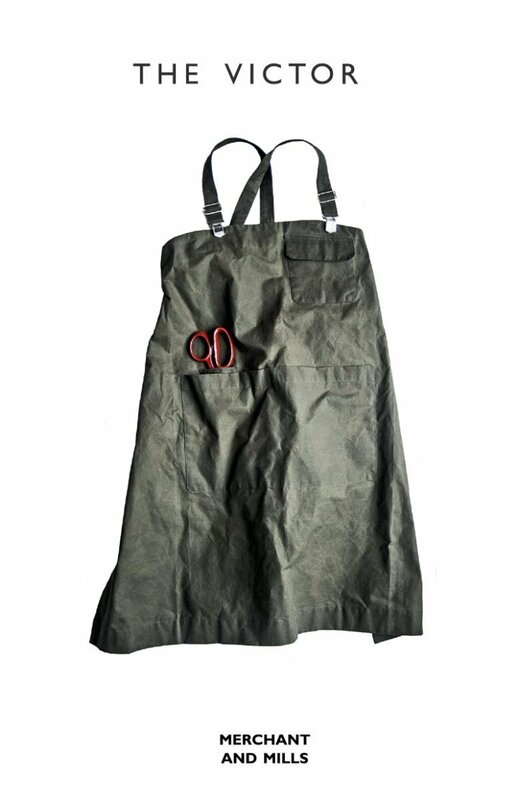 The Victor is a perfectly functioning apron for makers of all disciplines, adjustable for all shapes and sizes and featuring a cross back for comfort, top pocket for smalls and large divided waist pocket with scissor holder. The sample in the picture is made from Khaki Dry Oilskin, which can be found here. What was the inspiration behind your entry? Were there any challenges along the way when creating the pattern? I decided that my design must be really simple but something useful. My husband teaches in the art department of a school, which got me thinking about artisans generally, and how beautiful equipment can inspire us to work better and look smart and professional. I wanted an ‘a’ line shape to compliment such shapes as the Trapeze and Top 64, avoiding a fat bunched up waistline especially when wearing a thick jumper (often the case in a cold workshop). Making the toile was fairly easy but writing up the instructions took much longer than I’d anticipated, especially for the illustrations! I am in awe of pattern makers! Do you usually make your own patterns or work from commercial ones when sewing? I can remember making patterns out of newspaper from the age of 6, it was what my Grandmother and Mother often did as everyone sewed then, but they were very rudimentary. Now I mainly stick to commercial patterns, although I have been known to draw a quick sketch in a changing room and go home and have a go, but usually jiggling patterns together. My main role in life has been Mother to five wonderful people, now as they’ve grown up I work as an SEN teaching assistant. Where do you find inspiration from for your making? I think sewing is in my blood, my Grandmother was a brilliant seamstress. Working with fabric is very much like sculpture and I love the idea of being able to choose a medium with which I can create something totally unique. I get inspiration from magazines, Pinterest and history, I especially like the Edwardian era for design. After a long spell of not sewing, the 82 year old lady who won the first sewing bee was a huge inspiration and made me resolve never to give up this precious skill. Have you made any of our patterns, if so what is a favourite? I have made several of your patterns, I totally adhere to your philosophy of making simply and well and I am thankful to Merchant and Mills for providing such a quality brand. It’s really hard to find my favourite pattern because each garment is so rewarding. 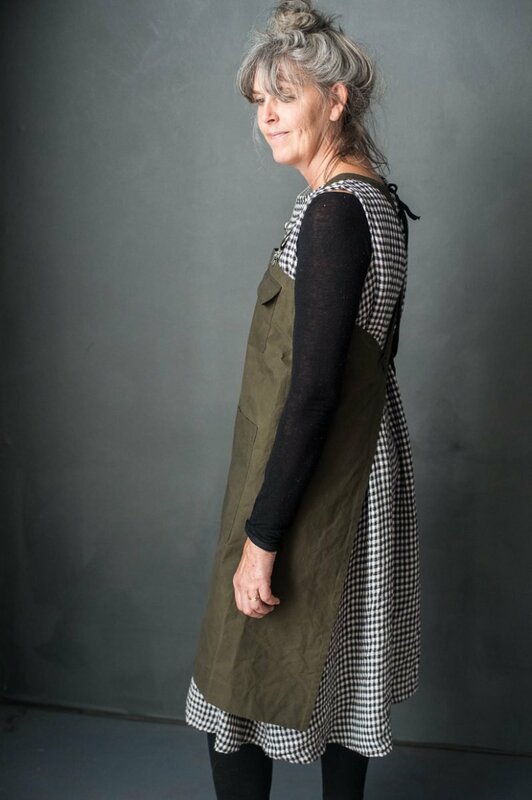 I suppose if pushed it would be the Heron top in the Workbook, which was the first M&M garment I made, it never fails to make me feel feminine and clever!! Do you try to make a lot of your own clothes and is this important to you? In an ideal world I would make all my clothes, I did once along with my daughter’s. This is important to me as I am passionate that our skills should be valued, used and passed on to the next generation. It’s so sad when we lose skills forever. What have you spent your winnings on so far and has it been hard to decide?! It was a total shock to win! Thank you so much, I have had a wonderful time. I have stocked up with patterns for the future, lovely linens, some gorgeous Harris Tweed (for the Haremare jacket) scissors and of course oilskin (for the Jack Tar bag) not forgetting material for my daughters who both sew. It’s been very hard deciding, I visited the shop, you could spend thousands as everything is gorgeous! I was torn between covering my sofa or a new wardrobe! The wardrobe got the better of me!